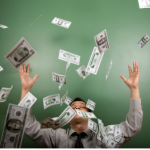 Law of Attraction: Can You Attract Money? Recently there have been scores of books and personal development gurus that have been endorsing the same mantra that claims any human being can get what they want. This theory has been around for generations but it was popularized during our time by the book “The Secret” by Rhonda Byrne. “The Secret” isn’t an original concept by Byrne, it has just been copied, compiled, and repackaged to bring forth a message that has been said to be the treasure of all great men of previous times. So what exactly is the secret? Well, it comes in the form of “The Law of Attraction”. So how does this work for money? The Law of Attraction although universal in nature, has been used most often as a way of reconditioning our thoughts with regards to money. Gurus say that as long as you have a mindset that attracts money, cash can flow easily and freely. On the same note, no matter how hard you work and try to achieve money, if your thoughts about money are negative, you will never be rich. The last statement may sound drastic but there does seem to be some truth to it. Some people have a subconscious belief that “money is evil”, or “rich people are greedy”, or “if you’re rich, you’re unhappy”. These beliefs have been rooted to our minds either from what our parents tell us, or what we see on television. We may not realize it, but these thoughts are what dominate our brains causing us to have a negative mindset with regards to money. Because we think of money negatively, we also attract negative results thus the reason why most people remain poor or broke. If we do believe in the Law of Attraction, this only means that we should begin to throw away any negative cliches about money. We should reiterate to ourselves that money is good and money comes easily and freely. They say that money only comes to those who have the mindset of the rich. Apparently with this small step of thought reconditioning, we can begin to attract the financial status that we’ve always wanted to have. Some people believe, while others don’t. The thing is, what have you got to lose? In fact, even if the law of attraction is purely false, it still encourages us to think positively and have a better attitude towards the things we want to achieve. True or not, it may be the beginning of achieving success financially.